Heat a pan with oil and do the seasoning with mustard seeds and curry leaves. Drop in the finely chopped onions and saute well until it turns translucent. Add the green chillies as well and mix well. Now dump in the radish with its juice and start sauteing .. Saute the radish until all its juice gets evaporated and cooked over medium heat . Now break the eggs and add to the burji. Stir and scramble the eggs soon after u drop it and combine well to blend with the masala's. Add all the dry powders now, turmeric powder, red chilli powder and salt.. Let the burji sit in the heat for 30 secs over medium low heat .. Stir once more and switch off.. Adding mustard seeds is totally optional..
U may also squeeze out the radish juice and add to the burji if u don like the smell of it..
Radish with egg looks simply inviting, would love to have with rasam...yumm! wow...unique combination ! I don't like radish that much...but this combo is gr8 ! loved it !n thanks for the recipe ! wow...what a unique combo..I do not like radish as such...but with eggs..I'm dying to try some ! healthy and flavorful....different with radish! nice one! That's a nice n new combo a welcome change from the regular - plain scrambled eggs..
First time here !! u have wonderful blog and nice collection of dishes !! Glad to follow u !! Radish egg burji is very inviting and delicious !! that's an interesting combo..did u use white or red radish?..i just had capsicum egg burji.. 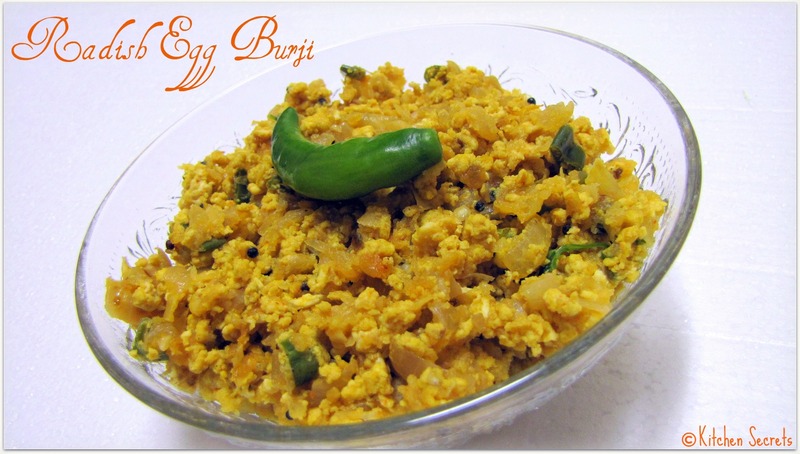 Adding veggie in egg burji is nice idea. tats a very uncommon combo.. radish n egg, sounds interesting and yummy!! will try this soon..
Wow this really unique dish..sounds delicious. A lovely combo!!! Its usually quite boring to eat plain radish but ur idea is awesome!!! I used white radish which we generally get it from Indian groceries ..
Nice twist... never tried this one.. looks fab..